Huisman Equipment has won a contract to provide the main crane for Voltaire, Jan De Nul’s newest offshore wind turbine installation vessel. The Dutch company will build the crane at its production facility in Xiamen, China, after which it will be installed on board Voltaire at COSCO Shipping Heavy Industry, where the vessel will be built. According to Huisman, the vessel will be equipped with the biggest leg encircling crane ever installed on a wind turbine installation vessel and together with its fly jib will have the highest lifting height in the world. 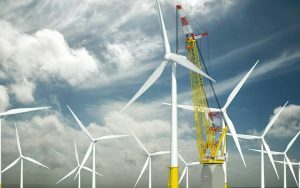 The crane will have a capacity of more than 3,000t and will be unique in its size and novel features to allow efficient installation of the next generation offshore wind turbines, the company added. “As the next generation wind turbines are becoming bigger and bigger, we keep on pioneering to develop novel and innovative solutions to install these turbines,” said Joop Roodenburg, President of Huisman. Voltaire is specifically designed to transport, lift and install offshore wind turbines, transition pieces, and foundations. Its key features include an operating depth of approximately 80m, a payload of about 14,000t and accommodation for 100 persons. Compared to Jan De Nul’s two other jack-up vessels, Vole au vent and Taillevent, this new vessel has almost 100% more deck space. It is set to be delivered in 2022.